After our success at the Orlando Regional, we were able to go back to the FIRST Championship St. Louis 2017. This will be our last time we go to the FIRST Championship St. Louis. Because next year the FIRST Championship will be held in Detroit. As we do every time we go to America, we have a few days free before the matches to explore the city. This time we also went exploring St. Louis. We started at the Dome at America's Center. We were able to take already a look inside, after this went to the city museum. During our visit at the city museum our founder received a mail for the FIRST Championship director, that they saw us in the Dome and they asked us if some people of our team were interested in helping with the field setup. So, we change our plans and went with circa 30 people back to the Dome at America's Center to help with the field setup. It was wonderful to meet all those enthusiastic volunteers and to be able to help with the field setup were we will be competing on. We made sure we still had some time to visit the Bush Stadium and the gateway Arch. We were lucky that our pit was close to the practice fields. So, we could practice between the matches. After the qualification matches we were at rank 30 out of 68 teams. 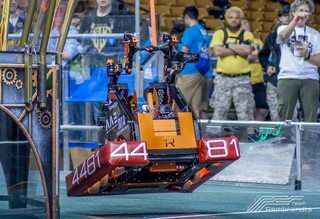 But for the first time in our teams history we were picked during the alliance matches by team 3419 - RoHawks. Together with them and team 1706 - Ratchet Rockers we went in the quarterfinals with team 1391 - The Metal Moose as reserve. The first match we won with only 1 point difference, but unfortunately the other alliance we to strong. Even with this it was an wonderful and great experiences. We had the time of our lives. At the last day of the FIRST Championship we awarded a supportive and helpful volunteer with a Team Rembrandts Award. We did the polonaise to Team 1519: Mechanical Mayhem to give them our award because their game was great and robot performance outstanding! Later that day we were honoured to receive the Mechanical Beauty Award from FIRST Team 2851: Crevolution Robotics! The FIRST Championship was an wonderful end of our 2017 season and we can't wait for the 2018 season. How to better spend your free day than to help FIRST Robotics Competition with the field setup(?) It was a great experience and we are pleased to help.